Feel free to drop by our shop on Williams Drive and let us get to know you and your vehicle. A Georgetown original, we are a full-service automotive repair facility. Our commitment to the community runs deep, as we were raised, attended school, worked and are raising families here. Currently, we are training the next generation of Lansdale Automotive employees, our own sons. We are the oldest and most established automotive repair facility in Georgetown. We opened our doors in 1990 and haven’t looked back. We service both import and domestic, light cars and trucks. From oil changes to timing belts, we are committed to the needs of our customers and pride ourselves on saving them money. When we make a recommendation for repair, we put you and your wallet first. Come by, say hello, drop off your car and experience the difference for yourself. We look forward to meeting you and your family! Print out the coupon below and bring it in on your first visit. 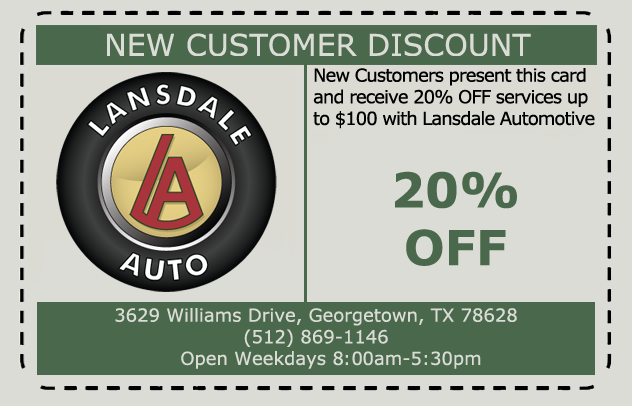 Come and see for yourself why Lansdale Automotive is the premier auto service shop in Georgetown!